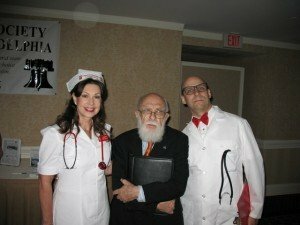 Join PZ Myers, Tom Flynn and Dave Silverman at Friday the 13th – Anti-Superstition Bash! 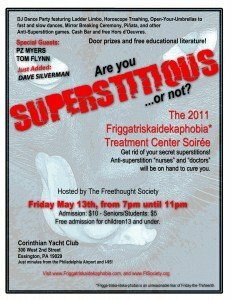 The Freethought Society’s (FS) next Anti-Superstition Bash will be held on Friday, May 13, 2011 from 7:00 PM to 11:00 PM in the beautiful Corinthian Yacht Club. The Club is located at 300 West 2nd Street, Essington, PA 19029. DJ Dance Party featuring Ladder Limbo, Horoscope Trashing, Open your umbrellas to fast and slow dances, Mirror Breaking Ceremony, Piñata, and much more! 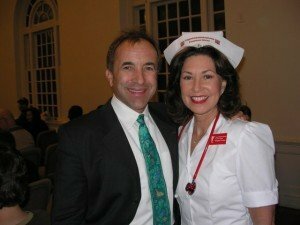 Anti-superstition Docs/nurses, psychic fortune teller, etc. Cash bar, free Hors d’Oeuvres. (No BYOB.) Door Prizes! Bring your friends to come meet and chat with our special guests PZ MYERS, TOM FLYNN amd DAVE SILVERMAN! Acclaimed caricature artist EMILY ANTHONY will be on hand offering caricatures for a small fee ($10), a portion of which will be donated to FS… author STEPHEN UHL has donated copies of his book “Imagine No Superstition” to be sold for just $5 at this party only! ALL proceeds benefit FS! Continue reading: Join PZ Myers, Tom Flynn and Dave Silverman at Friday the 13th — Anti-Superstition Bash!